Your credit score is the one number banks in the U.S. use when determining whether or not to extend you credit (and at what interest rate). It is extremely important for anyone living in the U.S. to build their credit score in order to get access to products like a good credit card, a mortgage, a lease on a new car, or even a phone line. For many people, the idea of building a credit score from scratch can feel daunting. This is especially true for international students, expats or young professionals moving to the U.S., who are in good financial standing, but are frustrated because they cannot access fair credit without a credit score. Your credit file in the U.S. (and thus your credit score) is only created once you start consuming credit – so get a loan and start making on-time payments, even if you might be able to pay for something in cash. Traditional banks will often not provide you that first loan, or will provide you with unfair terms, which is the exact problem we are solving here at Lendbuzz. Once you take out a loan, the amount and the payments you make are reported to the credit bureaus. A record of consistent on-time payments helps establish a good foundation on your credit file, and is the most influential factor impacting your credit score. Late payment of credit and utility bills will significantly hurt your score for years, so be sure to always pay on time. It is best to keep your credit card balance low and to avoid exceeding your credit limit. It is also recommended to pay your monthly balance in full whenever possible. Using your credit card regularly for everyday purchases, while keeping these smart credit habits, will be a good testament to your creditworthiness. If you’re truly starting from scratch, you may be denied a credit card. However, there are other options, and a secured credit card might be the way to go. A secured card is backed by a cash deposit, which helps remove the risk in case you fail to make payments. Otherwise you use it just like a regular credit card. The credit bureaus will see your good habits and you will soon be able to upgrade to a credit card with better terms. Whenever you apply for a new credit account, a credit inquiry is made by the prospective creditor. These inquiries are recorded by the credit bureaus, and their frequency can affect your score. Too many inquiries in a short period of time will have a negative impact on your credit. Managing your credit responsibly and maintaining good habits are a sure way to build your credit score and your creditworthiness in the eyes of lenders. As your credit history increases, so will your credit score. At Lendbuzz, we consider other factors aside from your credit score to approve your loan. 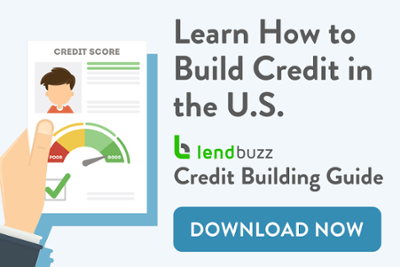 So buying a car with a loan from Lendbuzz and making consistent on-time payments are a great way to take that first step towards building a stellar credit score. And with a good credit score, access to credit products like a home mortgage becomes a reality. Lendbuzz is an online lender for expats & international students in the U.S. Our car financing platform offers international professionals attractive car finance solutions – without U.S. credit history or SSN. Our daughter just got her first credit card, and we want to teach her the importance of having good credit. It is good to know that your credit file is only created once you start consuming credit. I am glad to know that getting a loan and making payments can help your score. Our daughter will greatly benefit from this information, thanks. Thank you so much for your response and I’m glad to hear that your daughter is starting to build her credit. We work with all internationals, even the ones who have no credit history so please feel free to let your daughter know that we can offer her a car loan if she is looking to purchase a car. Please let us know if you have any more questions. few posts have been kinda boring? I miss your super writings. We appreciate your feedback! If you have any suggestions for blog post topics or ideas please let us know so that we can write the most relevant content for you! Let’s Talk Cars: To Buy or To Lease? What is a Credit Score and Why Should You Care?